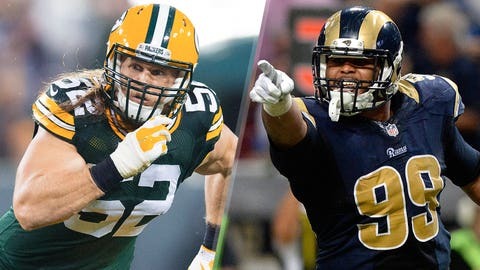 High-profile pass-rushers Clay Matthews (left) and Aaron Donald will be on display this weekend. The Packers offensive line hardly looked cohesive in Week 4 against the 49ers, allowing three sacks and five tackles for loss. If there’s one area where the Rams excel, it’s generating pressure up front, courtesy of the best defensive line in the league (tied for second in the league with 17 sacks). Rodgers is mobile and smart enough to evade a lot of potential hits, but getting into the backfield consistently can at least slow down Green Bay’s potent offense. The best way to keep the best quarterback in the league off the field? Run the ball effectively. Todd Gurley showed burst, acceleration and vision in his debut in Week 4, and helped kill clock time in the fourth quarter against the Cardinals. Expect the Rams to feed their star rookie the ball in an effort to try and keep Rodgers on the sideline. So far, Rams offensive coordinator Frank Cignetti has put Austin in the right places to succeed. Austin has rewarded his coach’s faith to the tune of 215 total yards and three scores. Using the speedy playmaker out of the backfield and on the outside gives the Rams offense a different dimension. The Packers are most productive when quarterback Aaron Rodgers is protected in the pocket. Rodgers was sacked three times over the first three weeks of the season and the Packers averaged 32 points per game. But when San Francisco’s pass rush sacked the All-Pro passer three times in Week 4, Green Bay’s offense mustered only 17 points. St. Louis’ defense is tied for the second-most sacks this season (17), so the Rams are sure to put plenty of pressure on Rodgers this Sunday. The Packers are actually the team that’s tied with the Rams for second-most sacks on the season, so they must employ a similar game plan on defense. Nick Foles has only thrown one interception this year, but the Packers can challenge his clean play by putting him under pressure. Linebackers Clay Matthews and Julius Peppers are the Packers’ leading pass-rushers with nearly 200 career sacks between the two of them, including 6.5 this season. They must set the tone for a pass rush that hounds Foles all day. The Packers are one of six remaining undefeated teams, and they very well may be the best of the bunch. There are few flaws with this squad, but there are a couple things that could cost Green Bay a game somewhere down the road. For example, kicker Mason Crosby missed a field-goal attempt last week. Also, as dominant as the offense can be, Green Bay is in the middle of the pack when it comes to third-down efficiency with a conversion rate of 40.4 percent (14th in the NFL). The Rams love to play spoiler and will be out to exploit one of the Packers’ minor imperfections in Week 5.